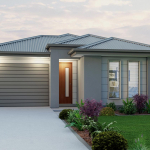 The house design Brooklyn 175 is a 3 bedroom home with two bathrooms. This lovely home even features a study nook and separate laundry. With a kitchen that has a walk in pantry. The living area flows out onto an outdoor alfresco entertainment area. Also featuring a master bedroom with a walk in robe and double shower en suite.